It has been a little while since my last blog on IP issues in the capture-create/modify/make ecosystem and I apologize for that. As many of you may know, Geomagic develops a wide range of software solutions to capture, modify and inspect 3D digital models of physical objects. We've been a little busy around here with our recent acquisition of Sensable, adding to our portfolio of technologies in the modify' space of our solutions. I am truly excited about the fit of this team into the culture here at Geomagic as well as the great technology (software and hardware) which we can take to market. Our historical business has been integrating with a wide range of scanning technologies in the industrial manufacturing space. Sensable is known for an integrated force-feedback (haptic) solution coupled with a volumetric modeling application which allows users to sculpt "virtual clay" with tactile feedback. Integrating this technology with our existing functionality will mean that users can start from a scanned model, rather than a blank screen, as they begin many organic modeling applications. If you are interested, for more information on the acquisition, see: http://www.geomagic.com/en/community/press-releases/geomagic-acquires-sensable-3d-design-and-haptics-businesses/. Andrew Ainsworth thought that he was doing nothing wrong. 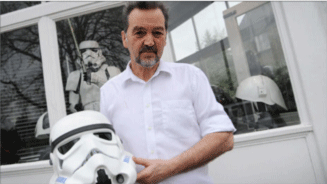 In 2002 he started selling helmets and body pieces from Stormtrooper uniforms to help cover schooling costs. He had previously done work for Lucasfilm and helped to create the original Stormtrooper costumes for the Star Wars film. He had been asked by George Lucas at Elstree Studios to make a prototype based on original drawings from Ralph McQuarry. After two days and a prototype Lucas allegedly ordered 50. When a helmet and a few other pieces pulled in nearly $100,000 for a sale at Christie's he knew he was on to something. He dug out the old molds and started selling them. After roughly 20 had been sold in the United States, someone else noticed - namely Lucasfilm. Lucasfilm sued Shepperton Design Studios Limited, and Andrew Ainsworth, in the United States District Court for the Central District of California on May 6th 2005. The complaint alleged that Mr. Ainsworth had violated Lucasfilm's copyrights in their Stormtrooper and TIE fighter pilot characters as well as Lucasfilm's"Imperial" logo trademark. Plaintiff alleges that Defendants copies Plaintiff's copyrighted artwork and Plaintiff's fanciful characters in Plaintiff's 1977 Star Wars Film, that Defendants prepared three-dimensional copies of Plaintiff's depictions, that Defendants publicly distributed those copies and that Defendants also publicly display them on Defendants' website, all without Plaintiff's consent. In September 20th 2006 the United States District Court granted a default judgment to Lucasfilm and awarded in excess of $40 million1 in damages (for $5M for copyright, $37.5M for trademark infringement as well as an award of attorney's fees). But there was more than a little problem. Because Mr. Ainsworth had no assets in the United States, Lucasfilm had to take their judgment to the UK courts for enforcement. First, lower courts held that Lucasfilm couldn't enforce the California judgment. They also found that uniforms and helmets were not protectable by copyright because they were not sculptures -- and even though they were copies Ainsworth had other defenses - all of Lucasfilm's claims in the U.K. courts were dismissed. Then the U.K. Supreme Court took up consideration of the case and handed down a fairly surprising ruling. On July 27th, 2011 they upheld the lower court rulings that the Stormtrooper uniforms were not in fact artistic or sculptural elements protectable by copyright, but instead, they were utilitarian and functional objects because they were a necessary element of the film that was being produced. They were a"mixture of costume and prop." As a result, they were not protectable by copyright. They did this while also resolving an outstanding controversy of whether U.K. courts could decide if non-U.K. copyrights had been infringed. The U.K. Supreme Court got it wrong. While you can't help to personally feel for Mr. Ainsworth in his battle with Lucasfilm, the logic is twisted in achieving their desired result. For the U.K. Supreme Court's analysis on why the uniform and helmet were not"sculptures" under U.K. law, see the discussion starting at Section 28 in the Court's opinion. Much of the discussion and focus is to the particular production methods used to make the helmet and uniform rather than what is really at the heart of the matter - is it artistic or creative however created? Read it and form your own opinion. Lucasfilm issued a statement after the U.K. Supreme Court ruling stating in part that the ruling"maintains an anomaly of British copyright law under which the creative and highly artistic works made for use in films - which are protected by the copyright laws of virtually every other country in the world - may not be entitled to copyright protection in the U.K." I agree. Disagreeing with the U.K. Supreme Court's conclusion doesn't take away from the fact that it is valid law in the U.K. If the frame of reference is a fantasy or virtual world, or a movie, or even perhaps a play, props are absolutely functional - they are required to produce or deliver the creative work. In that context, a Stormtrooper helmet is"functional." Outside of that frame of reference (i.e. the real world we live in) individual elements appear to be distinctive, creative works in their own right. Outside of the Star Wars film universe - who can really deny or argue that the uniforms and helmets were creative and therefore protectable? What is truly interesting is to consider how this ruling will apply to objects which might be reproducible by 3D printers - particularly as it relates to elements used in films or live stage productions. For example, the"cube" in the Super8 film might be viewed as content protectable by copyright in the United States but in the UK viewed as utilitarian (because a necessary element of the film it was used in). http://www.supremecourt.gov.uk/docs/UKSC_2010_0015_Judgment.pdf (the U.K. Supreme Court Judgment in Lucas Films Limited and others (Appellants) v. Ainsworth and another (Respondents) - all forty glorious pages of it!